Summertime holds it’s own special magic, especially when you’re lucky enough to have friends with a backyard boasting an old quarry filled with a very deep, clean lake. Long evenings gathered around the fire pit with a swarm of kids in and out of the lake; it’s like a summer camp for all ages. This year, a homemade masterpiece had been added; two new platforms built for jumping into the lake. Leaping from the platform to the lake was easily 15 feet and many teenagers ran, jumped and dove in; some even doing back flips. But others looked at it, shook their heads and said “no way”. Suddenly, one of the ten-year-olds caught everyone’s attention. She climbed to the top. She was longing to jump. You could see it in the angle of her body, her focused attention; muscles poised. But she couldn’t. 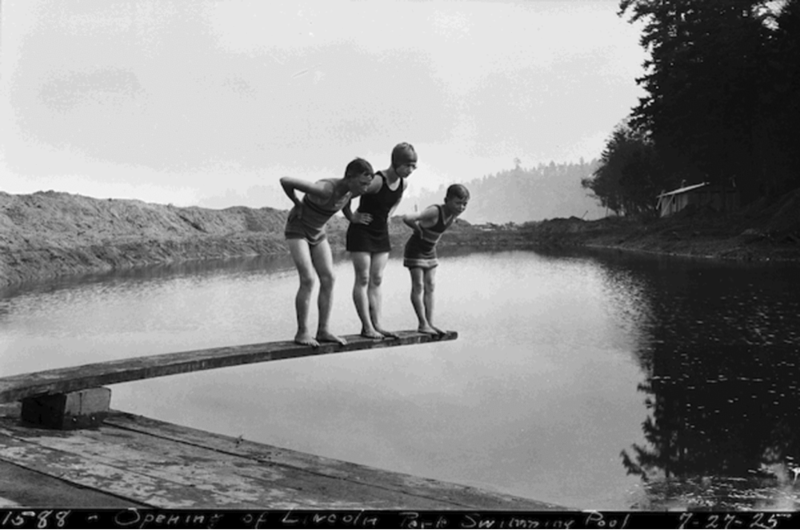 She was stuck, looking, while her teammates on the dock below cheered, encouraged and cajoled. The rest of the ten-year-olds had stuck to jumping off the bank of the lake, but this girl had a fire in her belly to go for the big one. Twenty minutes passed. Teammates yelled, countdowns went unfulfilled and started again, some of the older boys climbed past her and jumped in while she stood and looked. “C’mon, you can do it!” “This is it, jump this time!”. Finally – she leaped. It was beautiful. She ran, jumped, plugged her nose mid-flight and took the flying plunge. Everyone cheered. Grown-ups, teenagers and teammates. And, that’s where most of these stories end. But it’s the rest of the story that gets really interesting. After she took her flying leap, everyone was buzzing. As other adults joined the gathering, the first thing people said to them was, “Hey, see that little girl over there? Can you believe she just jumped off that platform? !” And, the girl herself decided that wasn’t quite enough, climbed out of the lake and raced to the upper platform – the much higher one – and this time, without any hesitation, ran and jumped. AGAIN. HIGHER. BETTER THAN BEFORE. And, wouldn’t you know it, one ten year old after another began to jump off that platform. This girl, by believing in herself and taking a risk way out of her comfort zone, inspired herself, inspired her friends, even inspired the adults watching. Watching the backyard drama unfold, I thought about all those moments in my life when I stood on the edge of a platform, wanting to leap but held back by fear. I’ve had cheerleaders and naysayers both, just like we all do. I’ve had to learn to tune them out and listen to my inner voice. Four months ago, I took the leap to self-employment and started my own consulting practice. After years of being an employee, it was terrifying to consider leaving someone else’s safety net and counting on myself as the sole income provider for my family. I hesitated for months, but when I realized it was leap year, I decided to register my new business on leap day in a symbolic salute to the future. 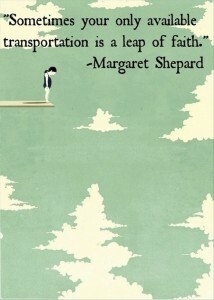 A great friend gave me the quote “Leap and the net will appear.” I trusted that, I trusted myself, and I went. It’s been exhilarating, invigorating and terrifying all at once, but now I’m ready to scramble up on the platform and take another jump, higher than before. It’s the same in our organizations: The people others talk about and follow are the ones who take the leap. It could be a leap to a new job, a new career, a new position. Or it could be a quieter leap, one of speaking truth to power or challenging the status quo. And, when people are generous enough to let us know a little of their story – to clue us in on how hard it is for them to make that leap – we cheer even harder for them. A friend recently told me about her decision to challenge her teammates for taking an incentive that she thought was unethical. Knowing that she and her husband were just climbing out of a period of unemployment made her leap even more inspiring. Is there a leap you’re looking at right now? Are you peering over the edge, wondering if you can really do it? Who are your cheerleaders; those who truly believe in you? What will it take for you to run and…jump? Organizations aren’t built on the status quo, and aren’t led by people who stick to the banks. Climb the platform, screw up your courage, and jump! You’ll be amazed at who you inspire, including yourself.